Growing your business doesn't have to be such a challenge. We have helped over 60,000 businesses reach more customers, and we would love to help you do the same. Do You Have Artwork or Files Ready To Print? Use our FREE, industry leading EDDM Mapping Tool, DoorPro™, to select specific carrier routes and zip codes with demographic, radius and even drive-time filters for precision targeting. 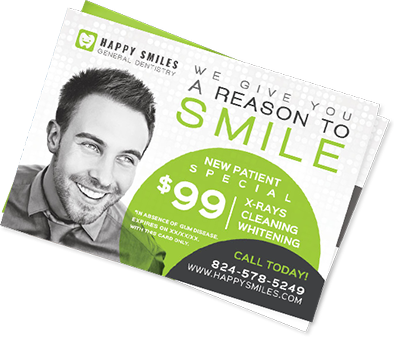 Pick any one of our full color Every Door Direct Mail approved postcards or brochures to create an impactful direct mail marketing campaign that will get you results. By using our intuitive online ordering system you are in full control of your direct mail campaigns. Just select the dates you would like your EDDM mailers to drop and we take it from there. Using your map selections, we make sure your direct mailers are delivered directly to every door in the routes that you select. No mailing list, no addressing, no permit required. Reach your ideal customer with targeted direct mail! Easily build and purchase your entire targeted direct mail campaign online, or give one of our Targeted Mail specialists a call, we're happy to help!